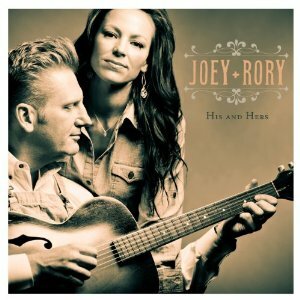 His and Hers, is a collection of musical stories from a marvelously unique duo like no other; Joey plus Rory. The world came to know and love this unique, and dynamic duo, when they took part in “Can You Duet” back in 2008 however, each of them had contributed a lot of memorable music long before then, both as singers and songwriters. Most of the time, Joey is the duo's lead vocalist, while Rory sings background vocals and plays guitar but on this album, Rory takes the lead on several tracks. As an album reviewer, I always like to know who wrote the songs and Rory Feek's name is one I've seen on a lot of album liner notes over the years. In fact, if you look up the songwriters on country hits that made the top ten from 1995 to 2005, I'm pretty sure you will find Rory's name on the bulk of them. He didn't become a household name, however, until Blake Shelton gave him his first number one with “Some Beach”, a cleverly written tune he co-wrote with the legendary Paul Overstreet. His songs continue to chart with his most recent number one hit being Easton Corbit's “A Little More Country Than That”. After listening to this album all the way through, my guess is that Rory may have written the bulk of the twelve songs because whenever a song is ear marked with a lot of heart, plenty of compassion, and lots of empathy, it usually indicates he had something to do with it. There is a beautiful video for “When I'm Gone” and this song is most definitely one of my favorite tracks. Be sure to have plenty of tissues nearby if you watch it. Joey has this magnificent voice that has a way of resonating deeply within you, so be prepared. Even if you don't watch the video, if you just listen to the song, her voice will grab your heart – I'm sure of it. The poignant lyrics, and splendid music that delivers them, are spot on. “And even though you love me still / you will know where you belong / just give it time / we'll both be fine / when I'm gone”. I really liked “Waiting For Someone”. I honestly love the flow of it, the subtle harmony of it, the simplicity of it. It's just an easy to listen to song. The title cut, “His And Hers”, is a beautiful, lilting waltz with wonderfully sweet peddle steel. It is a marvelous song even though the lyrics betray the resplendent music. On “Cryin' Smile”, the lyrics paint a sweet picture: “it's a goodbye kiss first day of school / a doctor callin' with good news / sinner standin' in a pew / getting' born for the second time / it's snapshots laid out on the floor / for a loved one back home from the war / makes tears fall like rain from a sunny sky / that's a cryin' smile” … which is the chorus, pretty much sums it up it and describes the title. “Teaching Me How To Love You” has some sweet harmony and an easy flowing, toe tapping melody with some 'you're gonna' love it' fiddle playing while “Some Day When I Grow Up” is a delightful “just glide me across the floor” two-stepper. The piano intro at the beginning is the perfect welcome mat for this sweet, feel-good tune. All of the instrumentals on this cut were superb. “Let's Pretend We Never Met” is pure unadulterated fun while “A Bible And A Belt” is a story song about how kids used to be raised and Rory also does a sweet version of the Tom T. Hall classic, “Your Man Loves You, Honey”. I thoroughly enjoyed all twelve tracks. The entire album is representative of what honest country music is supposed to be. On a scale of one to ten, I'll give it an eleven! Watch Joey and Rory's new television series "The Joey + Rory Show every Friday night on RFD-TV starting July 6th. The show is filmed entirely on location at Joey and Rory's farm and in their small community of Pottsville, Tennessee.